Organization: Main compartment plus top front comp. and bottom front comp., all with internal organization. When you put these two backpacks side by side, the first thing that pops is their different purposes. The 5.11 Rush 12 goes great for your one day outdoor activities, whereas Maxpedition Sitka Gearslinger suits your need when going to watch a game, for instance. Both backpacks offer many compartments for your various and multiple items. 5.22 Rush 12 gives you 16 individual compartments, but Maxpedition Sitka is also highly organizable. The Molle system on 5.11 Rush 12 is well placed and efficient and the military grade Nylon webbing for straps, handles in Maxpedition Sitka makes it durable and useful. 5.11 Rush 12 comes with great stitching, mesh pouches and feels very lightweight. It’s a versatile and flexible backpack with strong, easily sliding zippers. Maxpedition Sitka features YKK zippers and a triple coat of polyurethane and a final coat of DuPont Teflon Fabric Protector to repel the elements. The Duraflex buckles and hardware make this backpack durable and long lasting. 5.11 Rush 12 is easy to move around thanks to its strong handle whereas the waist belt eases up your moving when heavily loaded. 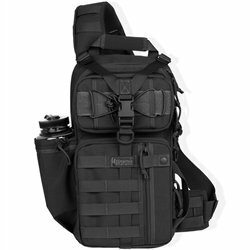 Maxpedition Sitka comes with a single shoulder strap (there is also an ambidextrous model) for the left shoulder for better weapon shouldering. This strap makes it easier to rotate the pack towards front of body. This pack may be worn in front also with easy access when sitting down. Both backpacks come with hydration bladder pockets, but some mention how Maxpedition’s Sitka bottle holder is a bit difficult to reach. You can carry your 13” laptop with the 5.11 Rush 12 and Maxpedition Sitka fits even a 15” laptop. 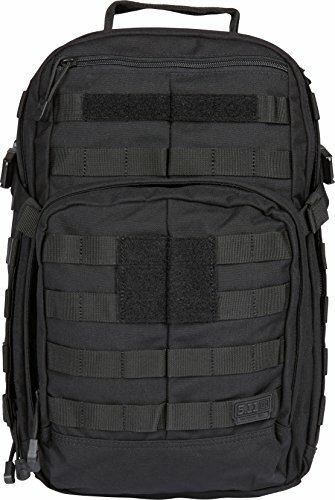 Both backpacks are comfortable to wear but for 5.11 Rush 12 the adjustable sternum strap makes a difference in height which brings more comfort. Some mention how the weight distribution on Maxpedition Sitka could be improved and the lack of a hip belt for 5.11 Rush 12 is a minus. 5.11 Rush 12 has no internal Velcro nor Molle panels to help you use the space when the bladder is not used. Maxpedition Sitka’s strap can’t be switched to the other side, so this counts as a “con”also. The internal pockets allow items to move around the pack for Maxpedition Sitka, while the 5.11 Rush 12 has no inside bottom pocket. Apart from these downsides, each backpack is a good buy, depending on your needs.